The best runs on the French and Italian sides of the Mont Blanc, on skiing and snowboarding. 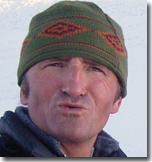 In France, Switzerland and Italy: Courmayeur, Envers du Plan, Vallée Blanche and Grands Montets. Day 1: Off -piste at Grands Montets. 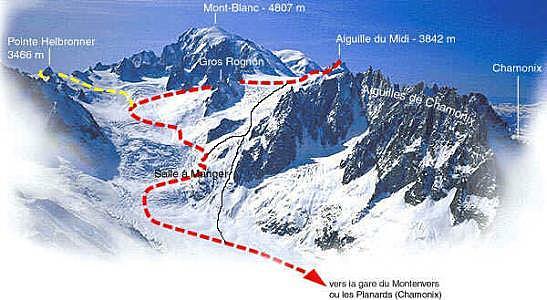 Up to the Aiguille du Midi and descend to the Requin refuge. Day 2: Refuge - Chamonix. Further off-piste elsewhere in the Chamonix Mont Blanc Valley. Day1: Grands Montets, an extraordinary with more than 2000m of downhill runs. Day4: The Italian side of Mont Blanc. 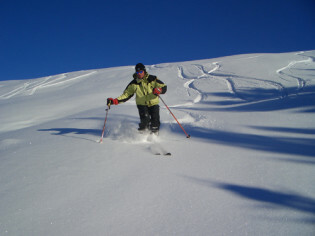 Skiing the Toula glacier down to Courmayeur. 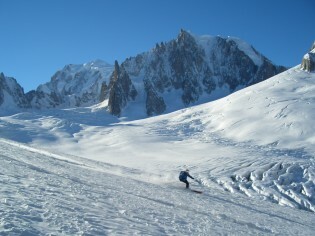 Day5: Return to Chamonix via the Helbronner Lift and ski down the Vierge Noire, the Italian Vallee Blanche.